I first heard about this book someone's blog (but can't remember who!) and it sounded like my kind of book. 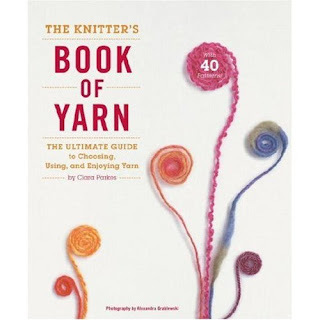 I love to know how and why things work the way they do and knitting is no exception. So I borrowed this from the North Melbourne library on Wednesday (Box Hill library also has a copy) and I've finished reading it already. The book is 255 pages and is divided into three sections, Fibre Foundations, Making Yarn and Ply Me A River and a fourth section at the back that has resources, glossary, recommended reading etc. I found the first section, Fibre Foundations, the most interesting. It's all about the different types of fibres, where they come from, their properties and what those properties mean to your knitting. For example, Cashmere comes from the Cashmere goat and is sooo expensive because each goat produces only about 170-227g of of fibre each year! The fibre is very light weight, 30% lighter than wool, and very warm, 8 times warmer than wool, and it's not as elastic as wool. It has relatively short fibres which mean it will pill more than some other yarns because the ends of the fibres work their way out of the knitted fabric and get tangled with each other. Interesting, isn't it? The second section, Making Yarn, is about how yarn is spun, dyed and a bit about various places to get your hands on it, eg fibre festivals.